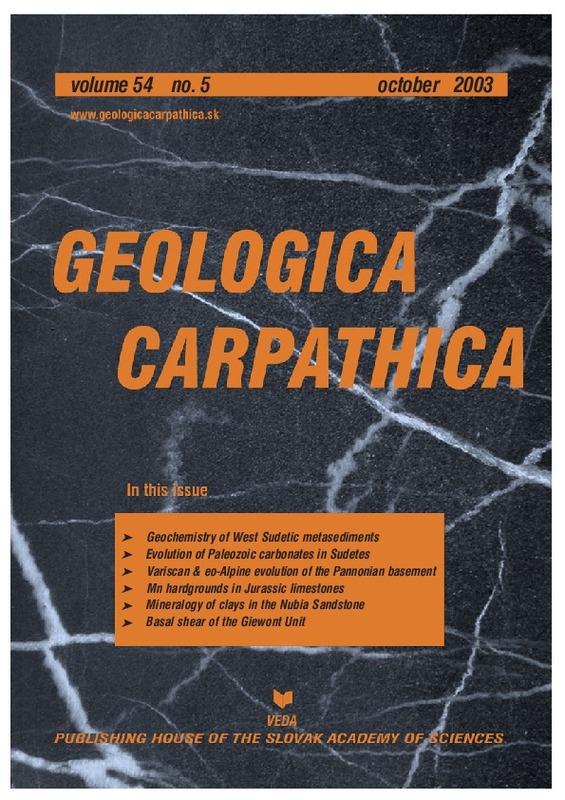 Abstract: Metamorphosed clastic sediments from three lithostratigraphic groups (the low- to medium-grade Velka Upa, and the low-grade Radcice and Ponikla Groups), exposed in a para-autochthonous to allochthonous unit of the Krkonose-Jizera Terrane (KJT, West Sudetes), were studied in order to discover whether they are chemically discriminable. According to chemical features of the metasediments (e.g. lower Th/Sc and CeN/YbN ratios), the Velka Upa Group is interpreted to be younger than the Neoproterozoic Machnin Group (of the KJT autochthonous unit) related to a Cadomian active continental margin setting. Metamorphosed clastics of the Ponikla and Radcice Groups proved to be chemically indistinguishable. As a result, these groups are herein combined within a single Vrchlabi Group of Cambrian-Ordovician to Silurian (±Devonian?) age. Precursors of the Velka Upa and Vrchlabi Groups were apparently deposited on a passive margin of the peri-Gondwanan Saxothuringian microplate. The passive margin originated in Cambrian and Ordovician times during extension and rifting of the former (Cadomian) active continental margin of NW Gondwana. Comparison of the metasediment geochemistry, together with the stratigraphic and structural affinities within the KJT, allows the Velka Upa and Vrchlabi Groups to be interpreted as broadly coeval: Cambrian to Silurian (±Devonian?) in age. Deposition of the Vrchlabi Group was more distal and sourced by sediment derived from a more dissected area of the Cadomian basement (fossil active margin) as demonstrated by an enrichment in Hf, depletion in Sc and Cr, somewhat higher CeN/YbN values and slightly more pronounced negative anomalies of Eu. The geochemistry of the metasediments reflects the complex paleotectonic evolution of the West Sudetes that started with Cambrian-Ordovician intracontinental rifting and subsequent sea-floor spreading during marginal fragmentation of Gondwana. Abstract: The metamorphosed carbonate bodies structurally embedded in the East and South Krkonose Complexes (ESKC — N Bohemian Massif, Krkonose Mountains, Czech Republic) have principally two types of sedimentary precursors. The first precursor corresponds to Early Cambrian dolomitized oolites and microbialites (Dolni Alberice) and provides practically the same fauna and geochemical features on residues as observed in Lusatia (Doberlug-Torgau Syncline). The Cadomian calc-alkaline meta-igneous rock sources, geochemically observed on this Early Cambrian, were also found in the Early Devonian of the Barrandian. The second precursor consists of open-sea calcitic wackestones/packstones and dolomitized packstones/grainstones (Ponikla and Horni Lanov, part) and yields fossil remnants, which are widely comparable with N Gondwanan carbonate sediments of the Bohemian type. The Middle–Late Devonian sedimentary continuation in the ESKC was likely absent (or restricted), and this was preceded by increased geochemical variation of insoluble residues in the marble precursors. Successively diversified compositions of trapped weathering products (regional to inter-regional background sediment, close to Post-Archean Average Australian Sedimentary distribution in REE, with a significant proportion of atmospheric depositions) suggest, that area precursors of the ESKC, Lusatia, Barrandian and Polish Central Sudetes were well separated and expanded to a great extent. The residues from carbonate rocks of the Sudetes correspond to a complex paleotectonic evolution — from Cambrian intracontinental rifting to Devonian arcs. However, there is a trend toward the East and with time toward the Middle Devonian, that Sudetic carbonatic residues indicate a variety of sources posing a wide spectrum of tectonic setting types. Abstract: Core samples of metamorphic basement rocks from the Great Hungarian Plain (Tisza Megaunit) were studied by petrographic and geochronological methods (Ar-Ar, Rb-Sr, Sm-Nd). On the basis of microtextural features of Al2SiO5 polymorphs in metapelites a regional distribution pattern was found, which correlates with geochronological age groups. This pattern confirms the earlier established tectonic subdivision of the basement of the Great Hungarian Plain, except for the Algyő basement-high, which has to be considered to represent a separate unit. A muscovite concentrate from a granite sample of the Mecsek Subunit yielded a Variscan Ar-Ar age of 299 Ma. The medium-grade metapelites of the Villany-Bihar Subunit are characterized by kyanite porphyroblast and sillimanite. Typical Ar-Ar muscovite ages are ca. 310 Ma and prove a Variscan cooling age of the metamorphic assemblages. In the NE part of the unit ages in the range of 202–266 Ma indicate a later thermal overprint. The staurolite and andalusite-bearing gneisses of the Bekes-Codru Subunit yielded Variscan cooling ages of ca. 320 Ma. In contrast, the rocks from the Algyő basement-high experienced their first metamorphic imprint in Early Permian time. Based on a Sm-Nd garnet isochron the high-temperature/low-pressure assemblages, including andalusite+K-feldspar±sillimanite formed ca. 275 Ma. An amphibolite facies, eo-Alpine (Cretaceous) overprint in the stability field of kyanite+staurolite+garnet is proved by Ar-Ar muscovite ages in the range of 82–95 Ma. It was followed locally by an Early Tertiary deformation. Considering the lithologies and the metamorphic and structural evolution, the Algyő-high shows many similarities to the Saualm-Koralm Complex of the Austroalpine unit. Like the latter and the Baia de Aries nappe complex in the Apuseni Mountains, it obviously represents an eo-Alpine thrust sheet. Abstract: Manganese crusts and nodules in Jurassic limestones correspond to those formed on recent submarine pelagic or hemipelagic non-deposition surfaces and hardgrounds. The ore mineralization is represented by pyrolusite, romancchite, manganite, and iron hydroxides. The structure of the manganese minerals, Mn/Fe and Si/Al ratio and Co, Cu, Ni and REE distribution in the ores indicate hydrogenetic and diagenetic accumulation of manganese minerals. Later, Cretaceous supergene accumulation filled fissures and cavities in the limestones. Abstract: The term Nubia Formation has been used in a broad range of stratigraphic and sedimentological connotations to designate terrestrial sandstone of Paleozoic to Mesozoic age in Egypt. The Nubia Formation is the oldest exposed rock unit and forms the basal part of the scarp face and the floor of Kharga and Dakhla Depressions. It is overlain by the Qusseir Shale Formation. The Nubia Formation in the studied locality is composed of very thick sandstone intervals intercalated with several thin shale intervals. Bulk samples are composed of clay minerals and quartz with traces of feldspars. Clay fractions separated from the different intervals of the Nubia Formation are dominated by kaolinite, smectite, and illite. Kaolinite is the major constituent in all samples. Smectite represents a major constituent in the shale intervals while it occurs as traces in the sandstone intervals. Illite occurs as traces in some samples. Clay minerals are classified into three assemblages. Based on X-ray and Scanning Electron Microscope analyses, the studied kaolinite is classified into two types. Authigenic kaolinite forms highly crystalline pore-filling books of stacked hexagonal flakes and occurs between quartz grains in the sandstone intervals while detrital kaolinite of lower crystallinity associates smectite and illite in the shale intervals. In the shale intervals occurrence of smectite as poorly crystalline flakes of unclear outlines is suggestive of detrital origin. Authigenic kaolinite formed during diagenesis of the Nubia Sandstone as a result of complete or partial dissolution or replacement of detrital feldspar grains. Abundance of detrital smectite in the shales intervals suggests their formation under arid or semiarid climatic conditions. Abstract: The paper presents a mesostructural and petrotectonic analysis of rocks from the contact zone between the Giewont and Czerwone Wierchy Units (High-Tatric nappes). Rocks occurring in the vicinity of Siadla Turnia and Turnia Olejarnia earlier referred to the “brecciated Campilian” (Late Scythian), are in reality mylonites (mainly dolomitic mylonites), and their unique preservation was possible due to dilatant sites linked with faults developed in the basement of the thrusting Giewont Unit. The mylonitization process as well as the thrusting of the nappe was not a one-stage, but a multi-stage re-activated process. Its cyclicity was determined by the build up and drop of pore fluid pressure, leading to changes of rheological behaviour of the deformation process. Fluids released to the shear zone together with the brecciated rock formed a suspension with low friction values, which acted as a “water pillow” facilitating the movement of the nappe mass. Deformation and mylonitization processes, the temperature of which reached 300 °C in some cases, accompanied further stages of tectonic transport.